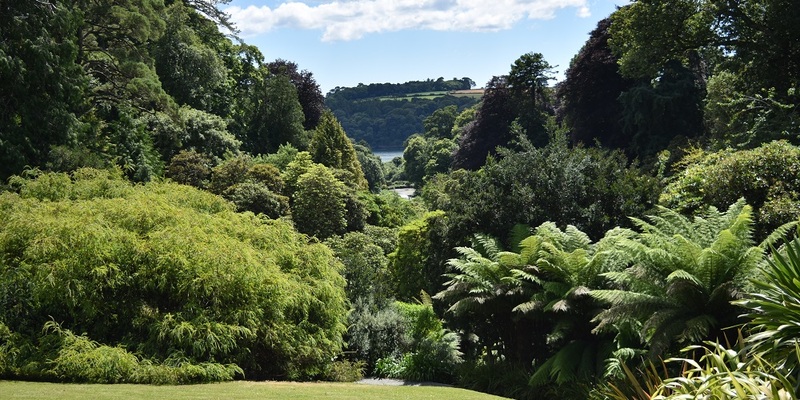 Trebah Garden is a really unexpected place, with both an amazing subtropical garden in a beautiful Cornish valley and an idyllic beach at the bottom. You could very easily spend the whole day here – we certainly did! The day we visited was warm and sunny so we started off with a picnic on the lawn just below the house. It was just a short walk from the car so transporting our food and picnic rugs wasn’t a problem. It was also a great space for the children to let off some steam after the journey in the car. If you’d rather not go self catering, there is a large café by the entrance that sells all manner of delicious food made using local produce. Fully energised, we set off to explore the garden. We started at the koi pond beneath the house (which unfortunately you can’t visit) then walked along the Beach Path to the Bamboozle. It really feels like you are in an exotic country somewhere; completely surrounded by tropical plants and vivid colours. The children loved Dinky’s Puddle and squealed with excitement when the saw the monster lurking in the deep. Next we strolled down Hydrangea Valley, which was a spectacular sea of huge blue blooms. This led to a rather Monet-esque white bridge above Mallard Pond – if you walk to the very end of the pond you’ll get a great view of the garden and valley, all the way up to the house. From here, we navigated the steep, narrow steps to the beach – and what a glorious sight was waiting for us. Delicious ice cream from Healey’s Boathouse, savoured on the private beach, looking out over Helford River. After the long walk down the valley, having a paddle in the cool, clear water was certainly relished by all! We eventually managed to tear ourselves away from the beach and headed back up the valley. We explored the Water Garden on the way up, which made me feel like I was in a tropical rainforest! All in all, we had a truly memorable day out and I would thoroughly recommend Trebah Garden. Child friendly? Yes, there is a beach, children’s trails throughout the year and two great play areas; Tarzans Camp for the over 5s and Fort Stuart for the under 5s. There’s also Trebah’s famous Paraglide (must be over 5 and under 16). Children under 5 go free and it is very buggy friendly.